My hope in presenting plays is that you can take them and change them to fit your own needs or to use to brainstorm ways to get your scorers into positions where they can be effective. For example, you might be able to find ways to screen for your ball screeners in some of your sets to help them get to their ball screen without their defender. These plays are a part of this week’s eBook bundle. You can create your own bundle by selecting any 2 of the eBooks that we have featured over the past few years for $25.00. Click here for the choices. 1 dribbles to the right wing. 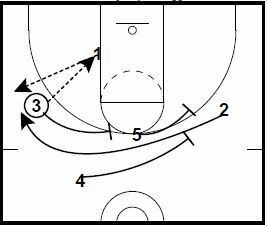 4 sets a ball screen for 2 after the dribble hand off. 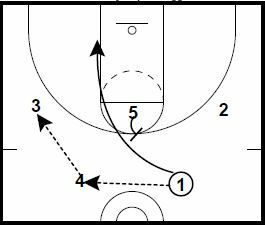 2 comes off the ball screen and can hit the roller or 1 coming of the screens. You could include 3 spacing with 5 flashing to the lane if that fits your needs. You could also use this as a way to isolate your 1 in the post if that is to your advantage. 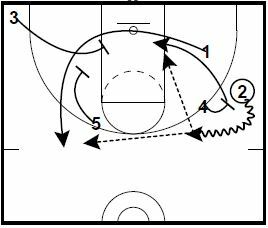 3 enters the ball to 1 in the low post. 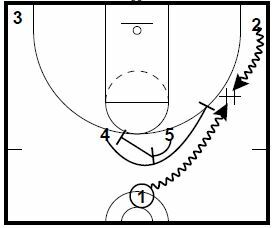 3, 4, and 5 set a triple stagger for 2 to cut behind the ball for a possible 3 point shot.